WASHINGTON — Mobile services, including data to aircraft, constitute the fastest-growing segment of the global satellite services industry, posting a 25 percent increase in sales for 2014, according to a new report from the Satellite Industry Association (SIA), a trade group here. 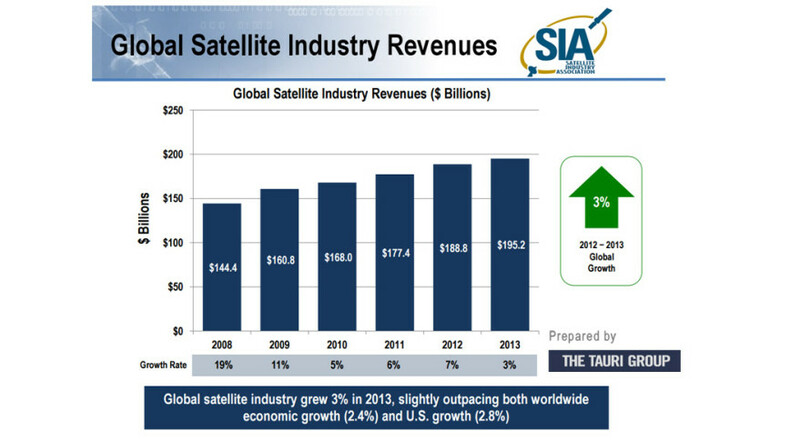 However, mobile services, with revenue of $3.3 billion in 2014, still represent just a fraction of the overall satellite services industry’s $123 billion in sales for the year, the SIA’s “2015 State of the Satellite Industry Report” said. Consumer services, primarily direct-to-home satellite television, continue to dominate the services segment, accounding for $101 billion in sales, up 4 percent over 2013, according to the annual market survey, prepared by the Tauri Group consultancy. Services remain far and away the largest segment of the overall global satellite industry market, which generated $203 billion in revenue during 2014, up 4 percent over the previous year. Satellite ground systems accounted for $58.3 percent of the total, followed by satellite manufacturing at $16 billion and launch at $6 billion, the report said. Launch sector revenue was up by 9 percent for the year, reflecting increases in the number of launches by Europe’s Arianespace consortium, from six in 2013 to 10, and by U.S. providers from two to five. Government customers continue to be the main source of revenue in the launch industry, the report said. Orders to launch 22 satellites were placed in 2014, compared to 32 in 2013, with half of the business going to U.S. providers. Russia’s share of the commercial launch market continues to shrink due to rocket reliability issues and political fallout from Russia’s annexation of Crimea from Ukraine, the report said. Despite nominal growth across most of the global satellite industry sectors — for satellite manufacturing the market was essentially flat — employment declined by 10,055 jobs, or 4 percent, during 2014 as of the end of the third quarter, the report said. The services sector lost 6,853 jobs during the first three quarters while the launch sector lost 3,092 jobs, the report said.